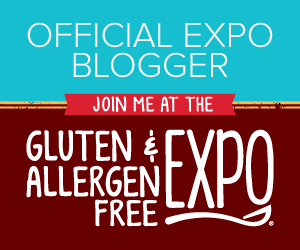 The Gluten Free Maven: How do Ud-do? Lillie's biggest wish in life is to go into a bakery and buy something. It's the sort of wish that might be reasonable for a poverty stricken child, or one caught up in the tumult of a war torn city. But when bakeries are prevalent on every main street and in every other strip mall, it's a bit odd. Unless your child can't eat gluten, or eggs, or nuts or any of the staples used in "normal" baking. As hard as I try with my home made creations, they just aren't enough for my daughter. She dreams of that giant sprinkle cookie or pastel laced cake in the bakery window, like an adult dreams of winning the lottery. As a parent I sigh and feel somewhat bereft that I can't fulfill such a seemingly simple wish. When Katz's came out with their chocolate frosted (and sprinkled) cupcakes, there was a glimmer of hope. I placed the see through plastic box of chocolate glazed goodies in front of Lillie and said triumphantly, "Like from a bakery"! Then I held my breath and waited for this rather picky girl to utter her decree. She smiled and said, "Yes, like a bakery." Breath released. 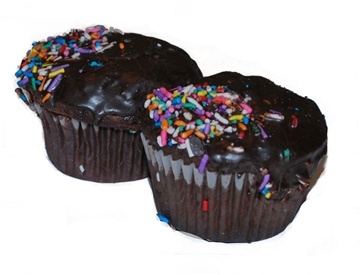 Katz's new line of gluten free cupcakes are fabulous and convenient. I ordered them online when they had a special promotion of free shipping for a $30 purchase. They also sent a 15% off coupon with a previous order. So, it was win-win. I ordered enough cupcakes for Lillie's whole class for her birthday party. Her school has a rule that you cannot bring in homemade treats for class celebrations, so in the past we've had to get creative, like having an ice cream party. But now, she feels she can be the same as all her classmates. This may be the first all gluten free birthday party in her school! The cupcakes are delicious, decorative, and really do pass for the real thing. They are a deep chocolate color and taste. Katz's is on the ball in terms of chocolaty taste. I also ordered a Chocolate-strip cake, which is similar to a Hungarian style cocosh cake. It looks like the "real thing" too. Keep up the good work Mrs. Katz! My local supermarket started ordering Udi's frozen breads and bagels. The bagels caught my eye as they were large first of all, and browned on the outside. The fact that I had $1 off coupon from the Udi's website motivated me even more! They had a more "authentic" look than the Glutino version we've been using thus far. 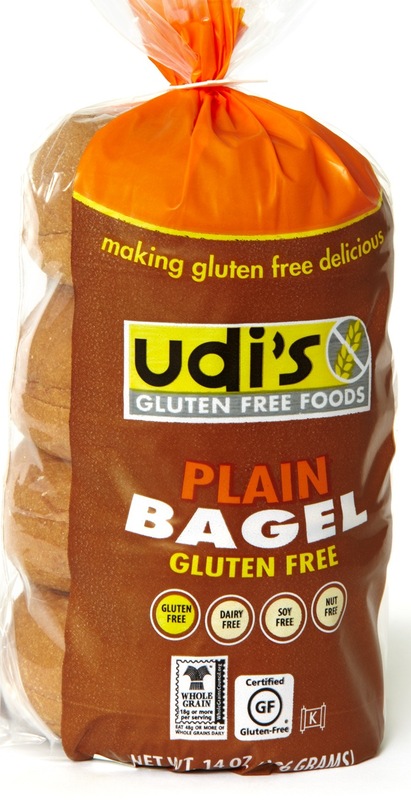 Although I still hold that the Glutino bagels are good, the Udi's ones are better. They've got the "crustiness" right that's elusive to many gluten free breads. No gluten free bread is really ever going to have that, very chewy texture of real bagels, because that comes from the evil scourge-gluten itself. The bagels have to be toasted for optimal flavor. When I made a pizza bagel for Lillie's school lunch, she reported that it got hard by lunchtime and didn't taste good. She is willing to eat pizza bagels at home though. Lillie will still only take Katz's sliced White Bread for sandwiches, as it doesn't get hard, and is good even un-toasted (unlike most gluten free breads). I feel like I've won the lottery (OK, maybe just the food sensitivity lottery) this month by coming across these two great additions to our pantry. Having a food allergic or sensitive child is a daily challenge, but there every so often I come across a recipe which is a hit, and subsequently falls into our regular repertoire, or I'll come across a product that makes my life easier. On those days I sigh a happy sigh. Spray a piece of foil or baking pan with non-stick cooking spray. Place bread or bagel halves on foil. Spread salsa over bread. Layer tomato, sprouts, avocado and cheese. Broil on 450F degrees for about 5 minutes, until the cheese is bubbly, and the remainder of the sandwich is heated through. If desired, lightly toast bagel before constructing sandwich. *To make your own dressing: In a small bowl, stir together 4 Tablespoons mayonaise, 1 Tablespoon ketchup, 1/2 Tablespoon pickle relish, 1/4 teaspoon lemon juice, pepper to taste. Yum! One thing my husband I do with the Udi's bagels is to divide them into thirds (instead of slicing in half). I have to be careful to not include fingers, but it's great since I get more topping (which is usually a protein like lox and cream cheese, yum!) and it toasts up better.